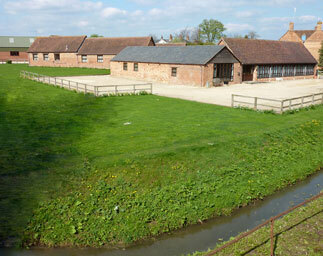 The office conversions were started in 1998 using local craftsmen, to breath new life into what were redundant old style farm buildings, keeping as much of the original character as possible yet creating a modern work environment, and these were quickly filled with a mix of thriving businesses. Some years later with all livestock gone from the farm the second phase got under way, a complete reconstruction of the nearby portal frame buildings. This brought about by the need of some of our office tenants to have some storage area, also other small local businesses seemed to need high quality small work units. We always try to look after all of our tenants, not just to get them in, but throughout their time at Brook Farm, whether it's a leaking tap, or an out of hours delivery, and (we've all done it!) "oh I've forgotten my keys". We are always on hand to help.